Sometimes accomplished people can be so understated that we often don’t know who really lives in our own backyard. Bill Gladstone is just such a person. A Yale and Harvard trained cultural anthropologist who traveled the world in search of mysteries, Gladstone is considered an international expert on indigenous cultures and the true meaning behind 2012 and its rippling impact on our world moving forward. Co-producer of the highly-acclaimed film, TAPPING THE SOURCE, as a literary agent, Mr. Gladstone has represented some of the most respected and influential authors of our time, including Eckhart Tolle, Deepak Chopra, and Barbara Marx Hubbard. As a trustee for the prestigious Club of Budapest, Gladstone collaborates with some of the greatest thought leaders of our time. And as an author, Bill’s newest novel, The Power of Twelve (sequel to his bestselling Novel, The Twelve), hits stores October 1st. 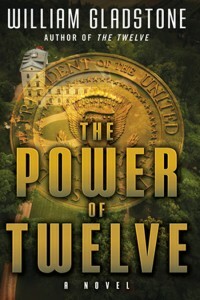 The Power of Twelve is a Dan Brown meets Michael Crichton meets Steve Berry. The year 2012 didn’t mark the end of civilization as many had mistakenly predicted. Rather, it marked a turning point in human consciousness, a shift toward a more humanistic, less violent existence. But not if Arnold Wheeler can help it. In The Power of Twelve, William Gladstone takes readers on a roller coaster adventure featuring alternate earths, characters with whom we can all relate, and a fact-based examination of the real meaning of the upcoming Mayan cycle. Part science-fiction, yet steeped in reality, part philosophical exploration, and all adventure, The Power of Twelve will keep readers turning the pages while its provocative subtext will leave them thinking a bit differently about the future. We recently had the pleasure of interviewing with one of the literary world’s most influential members. You have been an agent, publisher, author, and an innovator in the publishing industry. What is it about publishing that draws you?I was born into this industry; my father founded Arco Publishing in New York City in 1936. I have always loved reading books and have enjoyed writing even more. My mother was a devoted reader who read the entire Wizard of Oz series to me as a young child. She collected of what she referred to as second rate Victorian writers; her collection was gifted to Columbia University. My mom loved books; my dad saw books as a commercial product. The combination of seeing books as both a way to make a living and a way to experience the world and impact others through writing has made me a devoted agent, writer and publisher. What is the most profound change you have seen in publishing in the past decade? The last decade has been all about ebooks and print on demand. About fifteen years ago I helped launch the first ebook and first print-on-demand book companies. Clearly those have been the two most important new revenue-generating developments of the last decade. What do you expect to remain the same? We will still have the five major book publishers publishing the majority of bestselling books. There will still be book stores. But the percentage of revenue from print book sales will continue to decline. As an agent, what do you look for in an author and a book? I like to represent courageous and talented people who are dedicated to making a positive difference in the world. I have represented many first-time authors but with rare exception must now limit myself to working with authors with large established fan bases. You live here in north county San Diego. As an agent, does it matter that you are not in New York?When I first moved to North County in 1979, it was a long shot that I would survive as a literary agent. All the major publisher and agents were in New York, and my chances of success were quite small. But I lucked into representing books about technology, and it became an advantage that I was in California where all the technology experts were living and writing. Now, with email and other technology it is no longer essential that major literary agents be based in New York. One or two trips a year to New York is now sufficient to enjoy the same access to editors that New York agents have. How difficult is it for you to change professional hats from agent to author? And which role do you prefer and why? I like the variety of being both an agent and an author. As an agent. I never know what author or publisher is going to call me and what new project I will be representing or which title I represent has just won a major book award or appeared on a bestseller list. As a writer there is nothing better than writing words that inspire not just your readers but yourself as an author. This is why I will continue to both write and agent for many years to come. You write both fiction and non-fiction. For purposes of process, what do you find to be the commonality between the two; and what is the biggest difference? Good writing is good writing, and both require focus and the ability to communicate ideas. It is far easier and faster to write non-fiction than fiction. Fiction requires greater planning and delicacy. With non-fiction you create an outline and follow it. With fiction there are unexpected events that can dramatically change your initial writing plans. Characters can come alive in unexpected ways requiring, in some instances, major alterations in plot. You have co-authored and authored independently. What is the major difference, and which do you prefer? Much easier to write on my own. I like my co-authors and enjoy working with them, but my own pace of writing is very fast, so just easier to work alone. Even when working alone I work closely with an editor, so on one level I am never working alone. The collaborative nature of writing should never be underestimated. One of the unique aspects of co-authoring is the chance to learn from other writers. I learned a great deal working with Jack Canfield as his co-author on The Golden Motorcycle Gang and look forward to future collaborations with other authors should the opportunity arise. Is there a thread that runs through all your books, and if so, what is it? The basic thread that runs through all of my writing is that to be alive is a magical experience. There are fundamental laws and truths that govern the universe and in all my writing I explore these truths. How does your training in cultural anthropology play into your new book, The Power of Twelve and its prequel, The Twelve? I have lived with indigenous peoples on multiple continents. As an anthropologist I learned to ask questions first and only offer judgments after careful analysis of all data. I also learned that there is wisdom among all peoples and that fundamental human characteristics are shared universally. I explored the works of the French structural anthropologist Claude Levi Strauss and came to the conclusion that there are aspects of the human mind and the human experience which are fundamental to all peoples and perhaps fundamental to the essential purpose and meaning of all of life and the evolution of consciousness. What do you want your readers to take away from The Power of Twelve? Bottom line is I want them to enjoy the book and be entertained. In addition, I believe that The Power of Twelve will accelerate the dialogue that must happen if we are to alter the current course of human history. I love this planet and appreciate so much what our present world cultures have created. There is real danger of losing the essence of nobility and greatness as the world continues to overemphasize material values. It is time for each one of us to demonstrate courage in our daily lives and to put an end to wrong-headed thinking and fear-based action which have put our entire world at risk. Read more from William Gladstone at www.williamgladstone.org. Check out The Power of Twelve on Amazon.